Compression wood in softwoods and tension wood in hardwoods have properties, which adversely affect its usefulness for wood products. 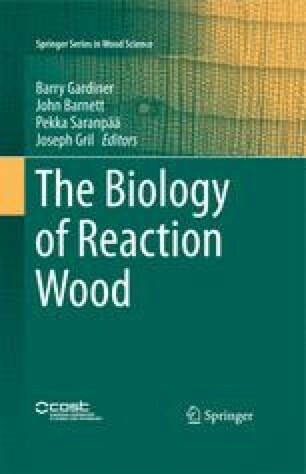 This chapter shows that reaction wood can be associated with many unsuitable wood properties. The results vary due to the fact that definitions about occurrence and severity of reaction wood are scarcely documented. A few properties seem to be even benefitting from the presence of reaction wood: the higher smoothness of compression wood surfaces, better shear strength of compression wood, higher toughness and impact resistance when tension wood is present, lower water uptake and swelling in fibreboards containing compression wood, and higher durability against fungi of compression wood. However, these are outweighed by disadvantages, which is the reason why reaction wood has a bad reputation in industry. The problem with reaction wood is that it is in most cases mixed with normal wood, which leads to non-uniform and more variable properties. This may lead to non-uniform swelling and shrinking, causing distortions, with additional problems of reduced strength and unfavourable surface properties. Wood-based materials such as particle boards or fibreboards are generally less prone to problems associated with reaction wood than solid wood products. With knowledge-based production methods the utilization of different wood types, including reaction wood, might be feasible.